Ligaments are bands of tough, elastic tissue that bind bones together at joints so that they can move. When a ligament is torn, it can either be repaired or replaced. Repair is the first choice, but often a torn ligament heals poorly and must be replaced. Most replacements come from connective tissues in the patient's own body (such as a knee tendon). Rehabilitation and return to full strength can take one to two years. As anyone who participates in sports or other strenuous activities knows, the knee is very vulnerable to injury. When the knee is subjected to abrupt or progressive stress, one of its four ligaments is likely to tear. Repair or replacement of these ligaments is a major problem. To reduce rehabilitation time and provide greater strength, the W. L. Gore Company developed an artificial ligament made out of Gortex. Gortex is a porous (full of small holes) update of Teflon (a tough material invented in 1969 best known for its use in waterproof materials). 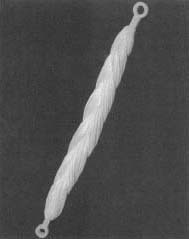 The six-inch-long Gortex ligament consists of about 1,000 fibers braided together for strength. The ligament is attached to the bones above and below the knee with stainless steel screws and soon becomes naturally anchored as the bone grows into and through the Gortex. Rehabilitation with the Gortex ligament can be as short as six weeks, and the procedure itself is usually done as outpatient arthroscopic surgery. The Food and Drug Administration (FDA) approved use of synthetic ligaments in humans in 1988. The approval, however, was only for patients who had tried and failed with a natural implant. I am an elite gymnast, in high hopes for the olympics one day. I have had a very serious shoulder injure. I have had 2 surgies already but I am still having major problems, I was wondering if it is and would be possible to also give or a replacement the ligament in the shoulder, like done with the knee. I am a student of IIT-Delhi building a knee joint simulator rig as part of my final year project,for that purpose i require polymers that can act as ligaments and tendons in my artificial setup. These polymers should have same mechanical properties as the ligaments and tendons profess during the motion of the knee. Hello. My name is Bojan Janevski from Macedonia and I am former basketball player. My career was brutally stopped after my torn ligament injury. I had a surgery when I was 16 and a half of my ligament was removed. The doctor told me that he can not implant an artificial ligament until I am 18. Now I am 26 I don't play basketball professionally, only as a recreation activity. But even then and also after a longer walk I have a big pain in my knee. My knee is also swelling. So what is your counsel. Should I go on a second surgery to implant an artificial ligament in my knee? And one more question. How long is the recovery period? I red that it is about 6 weeks. Could it take longer sometimes? Hello. My son is 18 and has been given the option of amputation or a knee fusion. We have been told that he cannot have a complete knee replacement because he is actually missing some of the ligaments in his knee joint. Before we make drastic decisions we are researching possible alternatives. Is it possible to implant missing ligaments that will, once healed and fused to the existing bone, hold the alignment of the knee joint enough that a replacement could be performed? There is much more to this story but there is not enough room. Suffice to say, he is in constant pain, walking on a cane for the last 1.5 years, has never been able to walk properly, and has had over 20 surgeries to date. He can't get a job because he can't walk without the cane and his'good' leg is taking so much of the strain of support that he can only stand for a few hours at a time. We know that one day the amputation and fusion will have to be done. I would just like to give hime the chance to be a functioning 18year old boy who can walk like a normal man for a few years. This message is specifically for Troy and Shannon. My brother has Ehlers Danlos as well. Shannon I'm not sure if your son does or not but I noticed that he is missing ligaments. My brother is 23 and has finished growing so we are in the process of getting him in to an orthopaedic surgeon. He is missing his ACL AND other muscles and tendons. He is unable to flex his foot at all (has foot drop) and his knee goes "out of joint" multiple times per week. He is able to live a somewhat normal life. He's able to walk but can not run and his knee will slip out anytime it is fully extended. Troy, what did you find out about the Gortex ligaments? I have read that typically tendons or muscles are pulled from another part of a body and attached where they are needed but I wouldn't think that someone with EDS would be a good candidate for this. Do either of you (or some other reader) have any information about the Gortex or other transplants in EDS patients? Back in 1990, my mom was told that there were only 11 known people with my brother's condition in the world so I'm not expecting to find anyone with his exact condition (EDS and missing parts - we think he is missing ligaments/tendons/muscles elsewhere too). Also Shannon, I had a friend who was told my numerous doctors that he was facing an amputation at the knee or fusion and he went to Colorado Limb Consultants in Denver. The doctor runs the Colorado Limb Preservation organization. They did surgery and his knee is almost as good as new. It might be worth it to check this out. Hello! I have a question too and would be very gradefull to be answered. I had 3 operations of my knee in the past. Everything is wrecked down there, but I only have one concern about one ore maybe two ligaments that don't hold my knee as they should. They had even been restored by my own ligaments in past (second surgery). So question is.. eren't artificial ligaments made out of Gortex that are to put into the body harmful to it, and that the body rejects it, even lead to various adverse reactions of body.. because I have heard from doctors to doctors that same story and I am very curious if there is any chance that artificial ligaments actualy exists and are able to restore your old ones? - because it would change averything in my life. thanks for reply and sorry for my english..
Hi, probably is a stupid question but i have to ask. I damaged 2 times my knee front tendon and i had 2 surgeries! I'm from Bulgaria and my question is: Where in Europe i can have a surgery with artificial tendon? I am looking everywhere for help here in australia but I am coming up against brick walls. I also have EDS and my left shoulder has currently been dislocated for the past 5 months, I recently had shoulder stabilization surgery but unfortunately that did not fix the problem as it only lasted for a few days. I am at a point where I need any helpful info that I can get because nobody here in Perth seems to know how to help me. I was interested knowing more about the Gortex which I will google but if anyone could email me more specific info and if it would be helpful to me that would be appreciated. To Troy Heynsbroek, the laser surgery sounds interesting you said it worked for your shoulders? Where would I find more info on that procedure? I am seriously looking into anything at the moment thats how desperate I am to get this fixed. Hello, my name is Cody. I also have EDS, I am 39 years old. When I was 18. I was working out alot and bench pressing too much. My senior year of football I took a hard hit to my left shoulder that put me out of the game. The whole next week my range of motion was terrible, and I was put in a sling. I am a very competitive person and being young went back to the game the following week. I thought all was good, ...until I took a brutal hit to my left (injured) shoulder. Out for two more weeks and also completely shredded my ligaments in my left shoulder. So being young and stupid, also knowing it was the end of contact sports for me I kept playing when the pain was tolerable. Had my first surgery in jan, 2001, was unable to use my left ARM for 3 months, only to find out the surgery did NOT work. It was at this time I saw a specialist who had diagnosed me with EDS. The weight of my arm had stretched the repaired ligaments to the extent of another tear. So the specialist repaired the torn ligaments with the lining of a pigs stomach (I'm being serious) and it has held for the past yen yrs. I have full range of motion but lack strength, still wake with pain but over was a success. I hope you all found this helpful, my email is cchusted@yahoo.com I can give you the surgeons name that first diagnosed me with EDS, and also fixed my shoulder the beat he could. Hi! My cousin was involved in a terrible car accident and both knees sustained bad injuries. The doctors said that the ligaments in both of her knees were 80% damaged and they could only save 20%. Would she be a canidate for the artifical ligament? Hello all. I had Goretex knee ligament replacements done 20 years ago in South Africa when I was 17. I shattered bits of my kneecap and ripped my cruciates apart in a hockey game. The operation was quite a big one, with rehad lasting a year having to learn how to walk, kneel and bend my leg and strengthen the muscles around my knee. I also lost most of the muscle in that leg and it took a lot of painful physio/exercises to regain it. I was told not to play sport of any kind for that year. I did everything the surgeon told me to do to the letter as the operation was not a pleasant one and I did not want to damage my knee any further or prolong the healing process. During a workers comp treatment for lumbar epidural, my ortho surgeon injected my spine, ligaments and tendons all over my back, neck, shoulders etc. with something that over the following weeks burned or corroded the cartilage, ligaments and tendons etc. Now my spinal column is unstable, I can feel the vertebrae moving not in sync anymore. I have pain now from the base of my skull down to my tailbone, whereas prior to these epidurals (3) of them, I had only lumbar pain. Is there anyway to re-grow the ligaments and cartilage? Can it be replaced. Please help. What my Doctor did was criminal medical battery to cover up for what a physical therapist did to me in a workers comp case. I need help. I can feel that the vertebrae are on held together by the interlocking facet joints which have also been burned by the chemical injected into me.